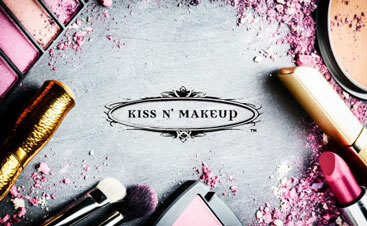 At Kiss N’ Makeup, one of our favorite services is the Mini-Makeover! We love being able to teach clients about their unique look and how to accentuate it. Each face is different, and should be treated that way! That being said, here’s a few of the basics we use while giving a Mini-Makeover. Today we’ll use Jane as a model, a beautiful woman who was wanting to get a new look. We firmly believe you should retrofit your makeup routine every five to seven years, as our skin is always changing and needs to treated with flexibility. Hey, none of us have perfect skin. We all have spots, either new or old, and the first order of business is to make sure they’re not drawing attention. Using a primer or tinted moisturizer, use a sponge or blender to cover the whole face. We prefer tinted moisturizer because it gives coverage while still being lightweight. We live in Texas, so humidity is a part of our daily lives and the last thing we want is a heavy primer weighting down your skin. Once your whole face is covered and any imperfections are “blurred,” it’s time to pick the features you want to highlight. The rule of thumb is pick two, any more is a no-no. For example, if you have full luscious lips and bold brows, those should be your two focus points. Avoid using heavy eye makeup or blush and put all your attention on bringing out your chosen features. With Jane, we saw her brilliant hazel eyes and high cheekbones as perfect candidates. For her eyes, we wanted to start with a smooth palette. We applied primer over the entire lid and around the eyes (which will minimize lines) to start. Over that, we chose a light base shadow with pink tones to match her skin and covered from the lash line all the way up to the brow. Once the shadow is applied, make sure to run your finger along your lid to see how the texture feels. Your finger should glide easily, and the shadow should feel like silk. This ensures the shadow that you apply on top of it will blend better and won’t crease. For the darker accent shadow, we chose a rich eggplant to bring out Jane’s hazel eyes. Try to choose a color that will pick up base notes in your eyes and make them shine, (i.e. dark sapphire for blue eyes, dark chocolate for brown). Apply the shadow in a “greater than” sign going from the bottom of the lash line out to the outer corner then up toward the brow. Smooth out with the same brush you used for primer to soften the lines. 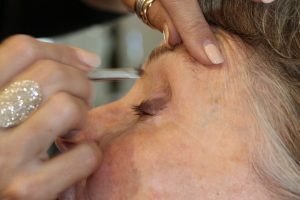 Once you’ve done that, choose a lighter shade and apply a small circle in the center of your eyelid. This will create a “pop” of lighter color that really opens up the eye. Brush over your whole eye with the primer brush a few times, blending everything and blurring any harsh lines. You’ll want to brush toward the outside of the eye, since that’s where you want most of the color to settle. Now you can take a wipe and clean up beneath your eye, in case any stray powder has made its way there. Doing your eyes first will save you LOADS of cleanup time. Reapply your tinted moisturizer if need be, and we’re on to the next step. Apply your favorite concealer under your eyes and to any spots that didn’t get enough love from the tinted moisturizer. Try to use a lightweight concealer, so it doesn’t get cakey. Our favorites are cream to powder concealers because of their smooth, satiny finish and blendability. When using cream to powders, or any concealers for that matter, a Pro Tip is to use your fingertips! Your fingers are natural conduits of heat and warm concealer spreads, blends and absorbs better. Next, we moved on to Jane’s wonderful high cheekbones. Using a warm color, we applied blush starting two finger-lengths over from the nose in an upward motion following the natural shape. To give them just a little extra umph, since they were one of the two features we chose, we applied just a touch of Tata Harper serum to give them a dewy finish. Last steps were a touch of mascara, filling in the brows (lightly!) and just a smidge of Brow Fix. 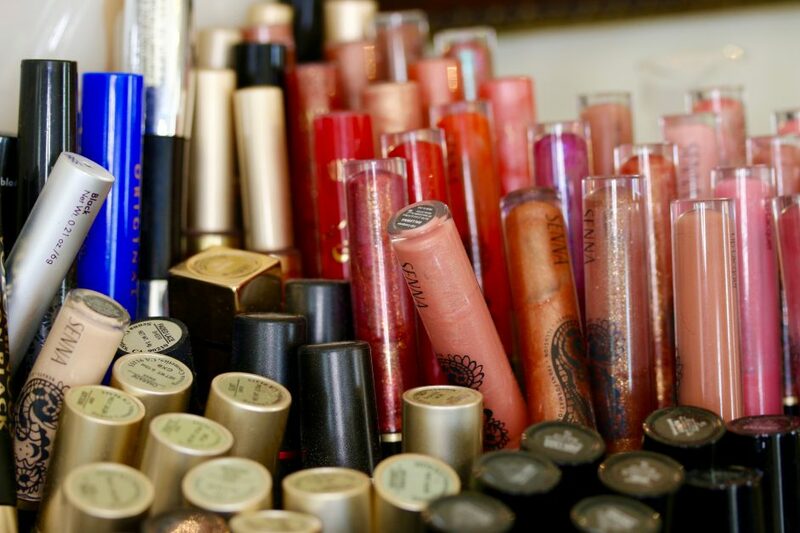 For lips, we just lined them and applied a flattering shade of matte gloss. Nothing fancy, we wanted the eyes and cheekbones to be the stars! 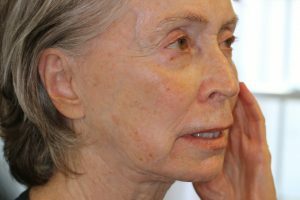 The outcome was exactly what Jane wanted: A natural look that freshened her face and highlighted her best features. 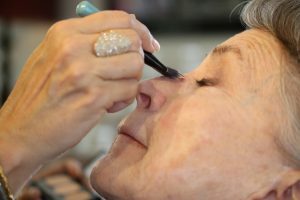 She’d been spending a lot of time on her eye, lip, brow AND cheek makeup, so choosing only two features to showcase is a big time saver and lets her natural beauty shine though. 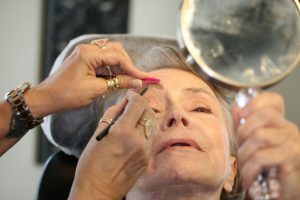 Every Mini-Makeover is different, just as every face is different, but the foundation is the same. 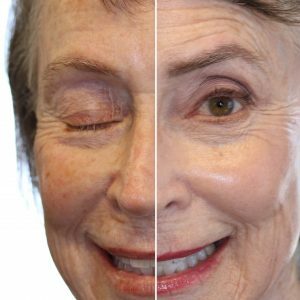 At Kiss N’ Makeup, we’re all about individual beauty and never want to see cookie-cutter makeup techniques cover up what makes you unique. With these tips, you can bring out your best self! 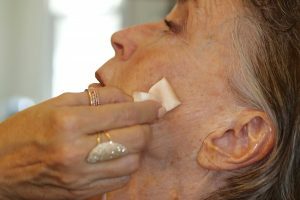 If you’re interested in your own Mini-Makeover, call and schedule one today! We can show you the best ways to flaunt your individual look and revamp your makeup routine in ways you may not have thought of. Hope to see you soon!